It was brought to my attention this morning that Emergent Village Coordinator Tony Jones, rambling on about nothing on a recent Nic and Josh Podcast (the wayne/garth podcast) accuses me of still living in the 80’s. In my defence, I want to strongly deny his accusation as untrue and slanderous. And besides, I had my mullet cut off last year. I will remember his insult later this week, be it ever so severely, when i review his book The New Christians. hey – whaz wrong with the ’80s?! and don’t forget, at Kirby Lane in Austin, 10% off with mullet! and 2 links from you in 2 days . . . you’re too kind. keep on insulting me and you will keep on getting links . .
Geez, here I insult you for the links, and you link to my old blog. My real site is http://tonyj.net. Honestly, I was hypnotized by the staggering beauty of Nick and Josh — I vow to never do a video podcast with them again. They tricked me into insulting you. What I meant to say was the last time I saw you, it was in Minneapolis, and your family was in Winnebago from the ’80s. You know that I deeply love you — and I love you even more on the week that you’re reviewing my book. I wish you had a final copy because I added a mention of you — it’s on page 59. So, your fame is about to increase exponentially. Somehow I suspect this posting connects somehow to your entry “him that P****th against the wall.” Call it a strong hunch. 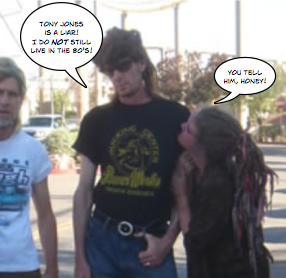 tony – ohhh yeah – the winnebago . . when we were homeless and on the road. . . . i get it .. Andrew is an 80’s retard AND white trash to boot!!! well, its true. the trailer park let us out one weekend to come up to Minnesota to see the biggest mall in the country. it was great. we hung out all day long in the parking lot and then came up to meet you. anyway . . about that review . . .
Um, do you accept bribes? tony – i am enjoying your book and its bringing back warm memories of our times together and the YL days. I did listen to the pod cast and i think the beers made it more interesting.!!! ok… just ribbing! But really come on Andrew that pic with the 4 of ya all rocks. Amy and i are considering doing an 80 party and depleting part of the ozone with at least 3 cans of hair spray some time in Austin this summer!